I see you use very outdated 4.18 version of UE4. This is almost 1.5 years old. In this version Firebase Invities doesn't work. You can turn this off or migrate to the newer engine version what is highly recommended because of new features and many bugfixes. My team's using 4.18 for a reason, so although new features and less bugs sound great, migrating is not an option for us. After disabling Invites, the packaging was successful, and now both google play service and firebase analytics are successfully initiated. I never thought it could be solved this easily. EDIT : Actually, one more thing. In the application, it says the analytics is initiated but there's nothing on the Firebase console. It's only showing default events like screen_view or session_start. There's no custom event. Is there anything else I should do other than using "Log Event" node? Last edited by netcop0207; 03-01-2019, 07:26 PM. Thanks to your help, Analytics works well now. As for the Authentication though, signing in anonymously works but 'Firebase Link with Credential'(google) doesn't. 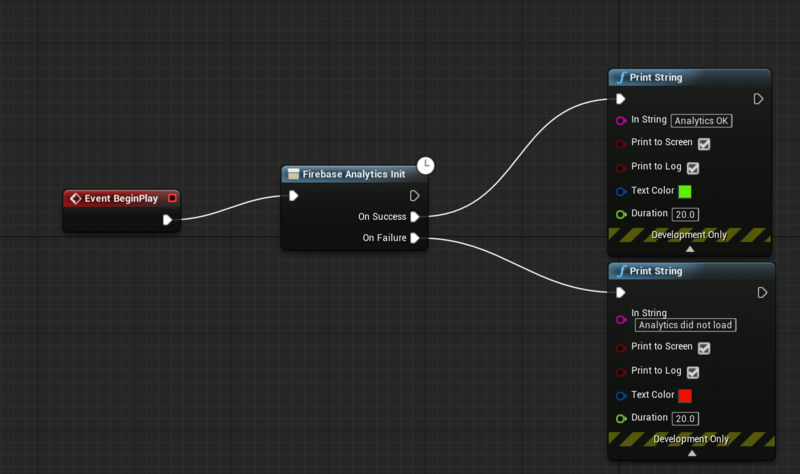 Attached are my blueprint setup and Firebase sign-in method settings. Is this another one of those things not supported in the old engine? Or are there any other steps I should take? Last edited by netcop0207; 03-02-2019, 04:42 PM. UATHelper: Packaging (Android (ASTC)): In project 'app' a resolved Google Play services library dependency depends on another at an exact version (e.g. "[16.0. UATHelper: Packaging (Android (ASTC)): 5]", but isn't being resolved to that version. Behavior exhibited by the library will be unknown. UATHelper: Packaging (Android (ASTC)): ces-measurement-base@[16.0.5], but play-services-measurement-base version was 16.3.0. UATHelper: Packaging (Android (ASTC)): ifact with the issue. UATHelper: Packaging (Android (ASTC)): uild.gradle file. Unfortunately, this is not correct way to Link Credential with Google. I ended up switching my project to 4.21. After I set up the nodes exactly like you showed me, I could successfully sign in with Google but when I try to sign in with Google Play or link to Google Play, it always returns invalid credential. I specified web application client ID and client secret to the Play Games authentication setting in my Firebase Console, following the official Firebase instruction. Is there anything else needed to be done? Could a link to the download location for these files be added to the docs? Even in context I have no idea where they're meant to be downloaded from. I eventually worked it out but it took a liberal application of googline. Last edited by Antidamage; 03-03-2019, 08:01 PM. Please login to your Firebase Console (https://console.firebase.google.com/), choose your app, and then click "Project Settings" icon. This is near "Project Overview" link. Then move down to "Your apps" section and there you will see "Download the latest config file". Yep that's what you need to add to the docs. I'm stuck on setup. I've put everything together according to the setup guide but Firebase isn't registering my events. 3. Is your plugin installed in the engine or project directory? This is a bug in the engine with including SDKs if Third-Party plugins are placed in the engine directory. So if you have installed it in the engine, please move plugin from [ENGINE_FOLDER]/Engine/Plugins/Marketplace/UltimateMobileKit to [PROJECT_FOLDER]/Plugins/UltimateMobileKit and try again. Please let me know if it helped you. If not, could you please attach logs from your device? Last edited by Antidamage; 03-04-2019, 10:15 PM.